FILE - Kurdish fighters from the People's Protection Units (YPG) stand in a house in Raqqa, Syria, June 21, 2017. 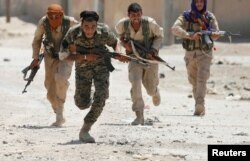 An influential London think tank is urging the British government to stop Britons from enlisting with a Western-backed Kurdish militia in Syria that's battling the Islamic State terror group on the ground that it, too, is a terrorist organization. The Henry Jackson Society warns in a study released Thursday that the militia, known as the People's Protection Units, or YPG, is a "subsidiary" of Turkey's outlawed Kurdistan Workers' Party (PKK), a separatist movement designated a terrorist organization by both the European Union and the United States. YPG leaders have insisted they are not connected to the PKK or guided by its leaders, who are based mainly in the Qandil Mountains of Iraqi Kurdistan. But the think tank argues, "It is clear that the YPG leadership answers, in matters large and small, to the PKK leaders." That was the official assessment of the U.S. National Counterterrorism Center, too, until Washington forged an alliance with the YPG in 2015 as part of the anti-IS operation. The father of a British YPG recruit who died fighting IS in March 2015 told the BBC he and other families of British volunteers were “deeply hurt” by the think tank's report. One British family sought to block the publication of the report with a threat of legal action. In The Forgotten Foreign Fighters: The PKK in Syria, analyst Kyle Orton argues the PKK has engaged in "deceptive propaganda" to mask the real "nature to its [separatist] project in Syria" — a spinoff has seen hundreds of foreign fighters enlisting with the militia to fight IS. The think tank maintains they could pose risks to the West upon their return. Turkish officials are likely to cite the study in their continued efforts to persuade the West, particularly the U.S., to drop its support of the YPG, and to cease using the militia as the international coalition's main ground ally in northern Syria. Turkish leaders have long argued that the YPG is just the PKK, which has maintained an insurgency in Turkey for more than three decades — a separatist agitation that's been met with a ferocious Turkish response. The PKK has engaged in terrorism against Westerners in the past when it has served the organization's purposes, kidnapping and killing tourists in Turkey. It also has built a moneymaking apparatus in Europe centered on organized crime and narcotics trafficking, as well as extortion from Kurdish expatriates, the think tank said. 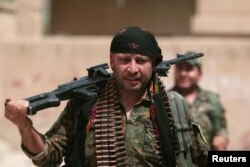 FILE - A Kurdish fighter from the People's Protection Units (YPG) carries his weapons as he walks the streets in the northeastern city of Hasaka, Syria, Aug. 21, 2016. The study profiles 60 foreign fighters from 12 countries who joined the YPG to fight IS in Syria and analyzes their reasons for enlisting. Twenty-eight of those profiled have been killed in action. Orton argues the foreign fighters could present risks when they return. "The potential use of these individuals in the PKK's vast criminal-terrorist apparatus in Europe is a serious cause for concern," he says in the study. "Though the YPG has been lionized in much of the Western press and political discourse since it became the West's primary ground force against IS, there are important questions — moral, legal, political and diplomatic — about how the YPG/PKK fighters are handled by Western governments," he adds. According to Orton, many of the Western volunteers, who probably number about 500, are unaware of the YPG's link with PKK, although some are, and they revel in the links. Most of the YPG's foreign recruits come from English-speaking countries. Orton believes that most likely reflects the YPG's earmarking of those countries for its propaganda and social media efforts. In the study, Orton says that foreign volunteers fall into four broad categories, and their reasons for joining are varied. "Military veterans formed a clear majority of the recruits in 2014, though that number has declined every year since as the YPG has altered its outreach strategy, focusing on the political far left," he says. Many of the former soldiers enlisted because they missed the military life and had difficulty adapting to civilian life. "Other former soldiers who had served in the post-9/11 wars, specifically Iraq, felt a responsibility to finish the job and/or not to let the sacrifices made go to waste," he says. The study lists another category of volunteers — before the YPG established a systematic screening process — as motivated by "self-serving considerations, notably avarice — sometimes directly pecuniary and sometimes in terms of reputation or fame." Among their number are some eager to satisfy an impulse to kill, although most of them now have been combed out of the YPG's ranks, according to the study. Other categories are defined as adventurers, including those seeking redemption for past crimes or drug addiction, and hard-left ideologues, including communists and anarchists. The think tank recommends that the British government screen returning Britons to "assess if they require any further state attention, either from the criminal justice system or social services." British intelligence officials have told VOA there are worries that some YPG volunteers may return suffering from trauma-related mental issues or that their warlike urges could be exploited by other ideological groups. FILE - Militants from the Kurdistan Workers' Party (PKK) run as they attack Turkish security forces in Nusaydin, Turkey, March 1, 2016. At the time, PKK rebels were suspected of being behind a recent attack in Diyarbakir province. Last month, Turkey's National Security Council accused the United States of allowing weapons it provided to the YPG to be passed on to the PKK. "This shows that both are the same organization," the council claimed. A spokesman for U.S. Central Command, which oversees American military operations in Syria and Iraq, told VOA after the Turkish claims that the weapons the United States has supplied the Kurdish-led Syrian Democratic Forces "will be returned to the coalition on completion of the mission" against IS. Shortly afterward, Turkey's state-run Anadolu news agency published the locations of nearly a dozen U.S. military bases across a 200-kilometer stretch of northern Syria. The bases listed by Anadolu are where American military advisers and special forces oversee the assault on Raqqa.